Remember the days of Snake being the only game on your cell phone, and competing with your friends to see who could muster up the highest score? While gaming on mobile devices has come quite a long way, sometimes it is nice to go back and enjoy the simple classics that got us started. 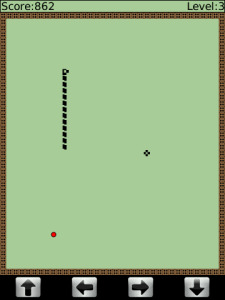 Snakes Classic is a great free game for your BlackBerry device that brings you right back to those days with a fun game. Users can configure the speed of the game, so you are able to start of slow to get back in the grove, and then speed it up as you get used to it again, and users can also configure the keypad controls, which will allow you to select buttons which are easy for you to reach and remember. If you want to kick it old school for a little, and enjoy some throwback memories, be sure to download your free copy from AppWorld today.